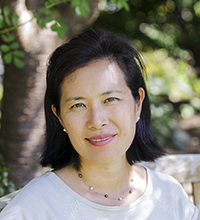 Bo Karen Lee is associate professor of spiritual theology and Christian formation at Princeton Theological Seminary. Her book Sacrifice and Delight in the Mystical Theologies of Anna Maria van Schurman and Madame Jeanne Guyon argues that surrender of self can lead to the deepest joy in God. Dr. Lee teaches classes on prayer for the seminary’s Spirituality and Mission Program, in addition to taking students on retreats and hosting meditative walks along nature trails.